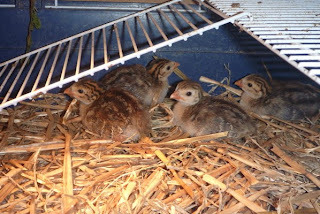 We have four guinea fowl keets. They were about a week old and were tiny, extremely cute and amazingly fast when we got them. They are not like any other type of poultry that I have ever dealt with before. They seemed to be very afraid of us and almost seemed to hate us. They are extremely skittish and flighty. From what I have been told this does not change as they grow up, they are meant to never be truly tame. When they are older we plan to free range them and let them eat insects and grass seeds, we will only feed them so that we can put them away safely at night. 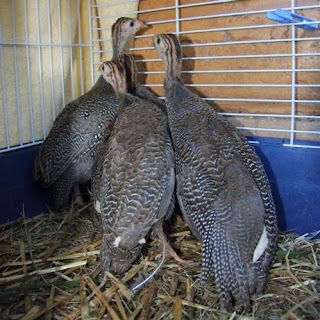 Guinea fowl are meant to have an innate dislike of snakes, foxes and other intruders. They are supposed to scream at any intruder, and have even been known to attack and kill snakes. It is difficult to know when there is anything around that should not be here, so the guinea fowl should help alert us when things are not right. To me they sound like the perfect watch dog. They will be cheap to feed, should let us know when things or people are around, and should also lay tasty eggs if any are females. As they have grown I have noticed that they still do not particularly like us even though they will eat from my hand. I handle them often to try and tame them and I weigh them once a week out of curiosity. They are still very fast and I am scared to let them out of the cage in fear that I will never see them again. When they are older I plan to let them share a house with the chickens, hopefully they will be happy with the arrangement when the time comes. If anything different is put on or near the cage they scream until it is removed, this gives me hope that when they are older they will let us know when there are intruders around. They have also always had a fear of thunder, even if they can hear thunder in the distance it makes them cry. Sometimes I know that there is a storm coming because they carry on, I assume that they can hear the thunder from far away long before I can hear it. These are truly fascinating birds. 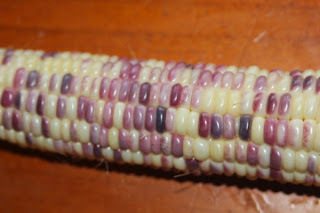 When they mature they change colour from the brown that they are now to grey with amazing white spots on each feather. Now that they are a little older you can start to see this adult colour coming in. This is meant to be the most common colour of guinea fowl but I think it is the most beautiful colour.